Remember the taco eating contest? Twenty-something each for Kevin and JP. On taco nights we used to cook pounds of ground beef, grate pounds of cheese and chop up heads of lettuce! Of course, I never did follow my own recipe! Tonight’s tacos got rave reviews. Fred said, “This stuff is really good! That’s high praise from Fred! It’s really hard to pin down a recipe as I improvise every time depending on what I have on hand. The only thing that’s really important is the cocoa and the herbs, they give it an authentic flavor and color. When the kids went away to college, this was one of the recipes they made for themselves regularly. It keeps wonderfully in the fridge…..just gets better every day! I really like the addition of the ancho peppers. They give it more depth without adding much heat. 30 – 40 taco shells, heated 5-10 min. in 350 oven. Serve hot shells filled to 1/3 with meat sauce. Pass shredded lettuce, grated cheese, chopped onions, chopped tomatoes, sour cream, salsa. There’s jalapenos in this version…. I used an ancho pepper as well as the green pepper and the jalapeno….including seeds. I salted and peppered the hamburger as it cooked. I used a full 28 oz can of diced tomatoes and 2 Tbsp tomato paste instead of the tomato sauce. Simmer 30 minutes. Use for tacos or burritos. The Great Taco Eating Contest lasted into the following morning. The previous night’s record was held by Kevin at 20 or 21. The following morning, JP ate 21 or 22 COLD tacos for breakfast (no microwaves back then). They were slightly competitive. Tacos are great! I prefer chicken tacos, spicy and soft. My DH is a beef man so most of the time beef it is. Love the photo as always. It is very interesting that you use cocoa powder. Sounds like a great combination with spicy beef. What a great idea. Thanks for the recipes! I LOVE tacos. I had no idea that cocoa powder was an ingredient. I’m curious; is that a traditional ingredient, or is that Patty’s touch? 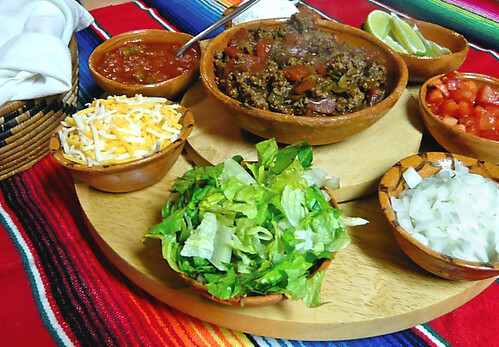 A lot of Mexican sauces have cocoa powder in them – Mole`s especially. I could eat tacos every day of my life and never get sick of them! Thanks for your ground beef recipe – I prefer your “now” version! Interesting use of cocoa powder. Cool. Both recipes look great to me (I’d replace the beef w/ Veggie Crumbles). I love using Anchos too! Bobby Flay turned me on to it and I can’t stop using it. They’re so nice and smokey! Cocoa powder huh? definitely worth a try..looks super yummy! I love tacos and so does my girls! This looks great.